Lord Sri Krishna said: O mighty-armed son of Kunti, it is undoubtedly very difficult to curb the restless mind, but it is possible by suitable practice and by detachment. The difficulty of controlling the obstinate mind, as expressed by Arjuna, is accepted by the Personality of Godhead. But at the same time He suggests that by practice and detachment it is possible. What is that practice? In the present age no one can observe the strict rules and regulations of placing oneself in a sacred place, focusing the mind on the Supersoul, restraining the senses and mind, observing celibacy, remaining alone, etc. 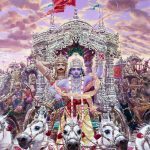 By the practice of Krishna consciousness, however, one engages in nine types of devotional service to the Lord. The first and foremost of such devotional engagements is hearing about Krishna. This is a very powerful transcendental method for purging the mind of all misgivings. The more one hears about Krishna, the more one becomes enlightened and detached from everything that draws the mind away from Krishna. By detaching the mind from activities not devoted to the Lord, one can very easily learn vairagya. Vairagya means detachment from matter and engagement of the mind in spirit. Impersonal spiritual detachment is more difficult than attaching the mind to the activities of Krishna. This is practical because by hearing about Krishna one becomes automatically attached to the Supreme Spirit. This attachment is called paresanubhava, spiritual satisfaction. It is just like the feeling of satisfaction a hungry man has for every morsel of food he eats. The more one eats while hungry, the more one feels satisfaction and strength. Similarly, by discharge of devotional service one feels transcendental satisfaction as the mind becomes detached from material objectives. It is something like curing a disease by expert treatment and appropriate diet. Hearing of the transcendental activities of Lord Krishna is therefore expert treatment for the mad mind, and eating the foodstuff offered to Krishna is the appropriate diet for the suffering patient. This treatment is the process of Krishna consciousness. 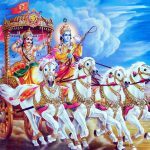 Accepting what Arjuna has said, Krishna gives a conclusion. What you have said is certainly true. But though a disease may be very serious, by taking the right medicine according to the doctor’s prescription repeatedly, after a long time the disease gets cured. Similarly, thought the mind is difficult to control, it is possible to control it by repeated practice according to the direction of the guru, by constant application of the process of meditation on the Supreme Lord (abhyasena) and by dissociation from the objects of enjoyment (vairagyena). As Patanjali says in his sutras, abhyasa-vairagyabhyam tan-nirodhah (Yoga Sutras 1.12): the mind is controlled by practice and detachment. 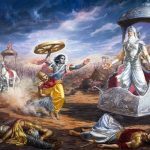 Since you defeated many great warriors in battle (maha-baho), and even defeated Lord Siva, can you not defeat the mind? If you are able to defeat the soldier called the mind by the weapon of the great process of yoga, then you can be called Mighty-armed. O Kaunteya, you should not fear: as you are the son of my aunt Kunti, it is proper that I help you. 6.35 The Lord said — No doubt, the mind is hard to subdue on account of its fickle nature. However, it can be subdued with difficulty by cultivating favourable attitude in the direction of the self by repeated contemplation of Its being a mind of auspicious attributes (these being eternality, self-luminosity, bliss, freedom from Karma, purity etc. ), and by the absence of hankering produced by seeing the host of evil qualities in objects other than the self hankered for. Responding in regard to Arjuna’s queries about control of the mind, Lord Krishna states that the mind is almost impossible to control; yet by constant practice, abdication from sense objects by dispassion and repeated meditation on the atma or soul it is possible to restrain and control the mind. With the senses withdrawn, being free from the obstacles of lethargy and distractions by means of incessant practice and dispassion, the mind remains immersed in the Supreme Self. 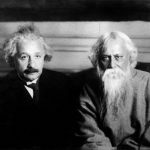 It is stated in the Vedic scriptures that the tranquil mind in equanimity resides in the Brahman or spiritual substratum pervading all existence. Free from all conceptions and modifications is what is known as samadhi. 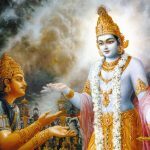 Then Lord Krishna responding to Arjuna’s queries concurs that without a doubt the mind is extremely difficult to control and similar to confining a cyclone in a pot; but Arjuna should shake off his trepidation and make the effort, for the mind can be brought under control by the repeated practice of meditation. One should first withdraw the mind from the influence of sense objects and then focus the mind in concentration internally on the atma or soul. By practising indifference towards sense objects, dispassion will arise in the senses and the mind will show no interest and will not gravitate to anything else other than the atma. This is accomplished by reflecting on the transient nature of anything other than the atma and contemplating on the inherent defects in such transient objectives. The vocative words maha-bahu meaning mighty armed one indicates in a general sense that only a superior person trained in such practice will meet with success whereas a normal person will not be able to. In the specific sense maha-bahu means one whose arms are mighty enough to control an enemy should be mighty enough to control the enemy knows as the turbulent mind. The particle tu meaning but denotes there should be no lethargy in effort. śrī-bhagavān uvāca — the Personality of Godhead said; asaḿśayam — undoubtedly; mahā-bāho — O mighty-armed one; manaḥ — the mind; durnigraham — difﬁcult to curb; calam — ﬂickering; abhyāsena — by practice; tu — but; kaunteya — O son of Kuntī; vairāgyeṇa — by detachment; ca — also; gṛhyate — can be so controlled.